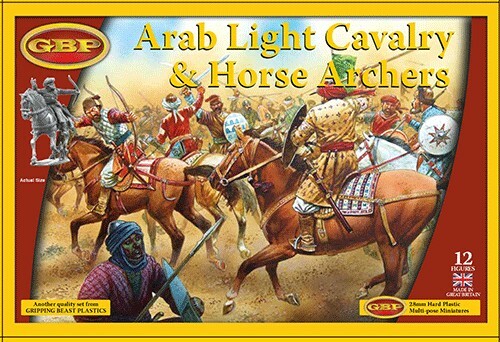 12 Multi-part plastic Arab Light Cavalry. Comes with enough parts to make all 12 into javelin/spear armed or bow armed chaps.or, of course, a mix of both. The figures can be constructed as Arabs, or as the Turcomen steppe warriors who fought both alongside and against them. Many head variants and arms with trumpets and swords are included.